The 2013 ATP World Tour Finals will start exactly a month from now, on November 4th. Traditionally, the eight best players of the year get the honors of playing in the season finale of the ATP. This year, however, tradition might be broken for the second straight year running. Rafael Nadal and Novak Djokovic have comfortably qualified for London with a wide berth from their competitors, and will look to compete for the future No.1 ranking, which will pass to the Spaniard in a week or two. However, Andy Murray, who's qualified as well, is currently out of competition after undergoing a back surgery. This puts a question mark on Murray's participation in the event, and opens the door for the year's 9th best player to play in the prestigious tournament. Joining these three is David Ferrer, who already ensured himself a spot in the tournament, despite the lack of official announcement so far. His fans have no reason to worry, though - Djokovic's participation was officially acknowledged only weeks after it was actually confirmed. At any rate, four - or five, depending on Murray - spots are still up for grabs and there's no shortage of pretenders. The race is extremely close this year - here's a look at the next players on the list, as they stand on Friday night (before the Beijing and Tokyo semifinals), along with the information about the players' next tournaments and available points. * Players still participating in Beijing (Nadal-Berdych, Djokovic-Gasquet) or Tokyo (Del Potro-Almagro, Raonic-Dodig). A semifinal win will add 120 points to the player’s Oct 7 expected total; winning a title will add 320 points to that column. So far, neither Beijing nor Tokyo changed the position of anyone in the race - the next in line are Berdych, del Potro, Federer, Wawrinka and Gasquet. Both Berdych and Del Potro improved their positions this week, reaching the semifinals in their respective tournaments and keeping their distance from the players behind them. It's the next group of players that's so close right now - only about 100 points separate Federer (#7) from Gasquet (#9), with Wawrinka in the middle. Tsonga and Raonic are about 300 points behind - a gap both could easily eliminate in the coming weeks (especially Raonic, who might catch up in the next two days in Tokyo). Haas, Isner and Almagro are ~500 points behind Raonic, but one good tournament might be enough to get them closer in contention. What does the future hold for these players? 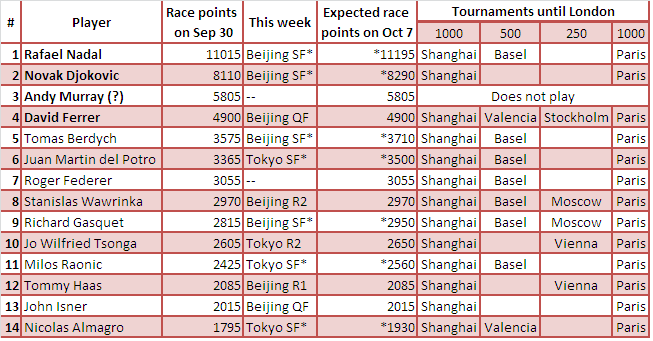 On paper, everybody but Murray is playing Shanghai and Paris, the two mandatory tournaments offering the largest amount of points to the field. Shanghai will be of special importance to Federer, Wawrinka and Gasquet, each of whom will want to get ahead of the others. Wawrinka and Gasquet might then clash head to head in the Kremlin Cup in Moscow, where they're the top seeds, while Tsonga will try to overtake them at the same time in Vienna. Basel has an extremely strong entry list this year, much like Beijing - interestingly enough, none of the major race contenders but Almagro plays in Valencia, where most would be able to pick some much needed points. We might have a much clearer picture of the situation after Basel, which could determine a lot in terms of the final standings, but if not - the final hurdle would be Paris. Since Paris and London are, once again, played back-to-back, we can expect many of the players who qualify by then to withdraw entirely or lose early in Paris. The rest will battle it out to get a final ticket to the big show. Last year, most of the players who threatened to take the #8 or #9 spot lost early in the lead up to London. With the race being as tight as it is, I expect it to be quite different this year - who do you think will deliver? Keep track of this post for all the race updates, or like us on Facebook!